During the remodel, hubby and I decided to make one of our bedrooms a room for the little guys(aka grands). 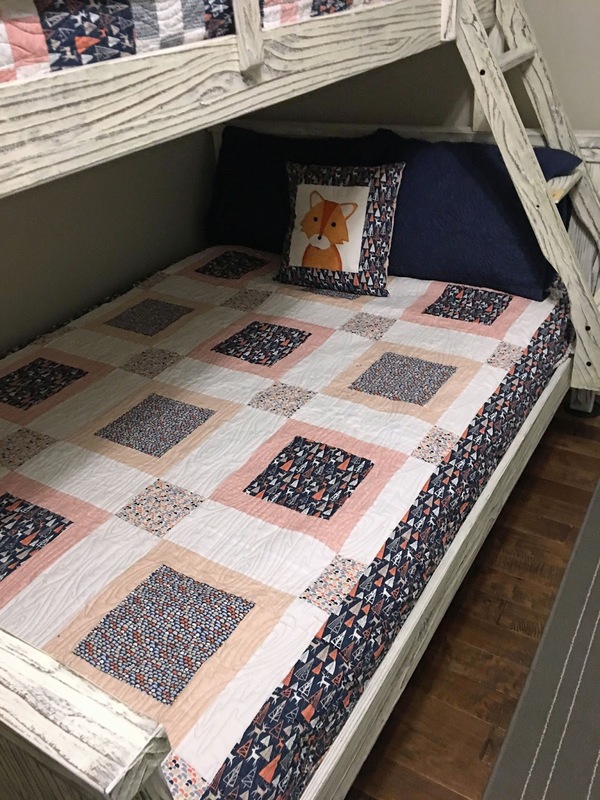 With four daughters, we are thinking we will have several grands and thought bunk beds would be a good way to sleep several. The bunk bed is a full over twin and works really well when I need to sleep with the 3 year old when he spends the night! Hubby also thought he could make a trundle for under the full and we pull out when we need it. A great idea! The above photo is from the door. One thing after all daughrters and now all grandsons, my quilts are pretty much all florals and very bright colors. 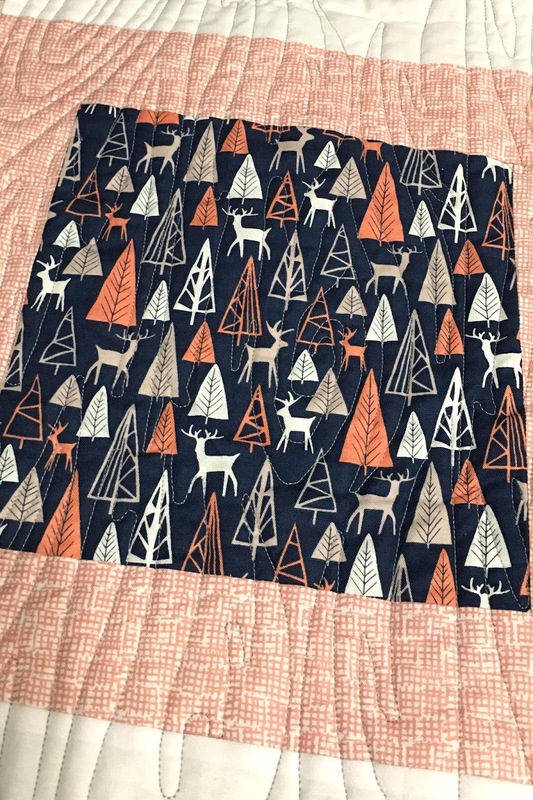 I wanted to go with a wilderness theme and found this very cute fabric while shopping with friends. Sorry I don't remember the name of the fabric or the company. 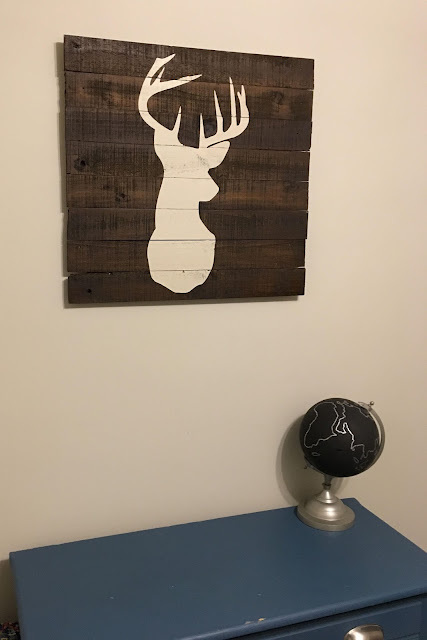 It was just what I wanted for this room. I just went with my own design for the twin and full quilt but wanted the navy deer fabric to be the focus. I kept this fabric for bigger blocks. 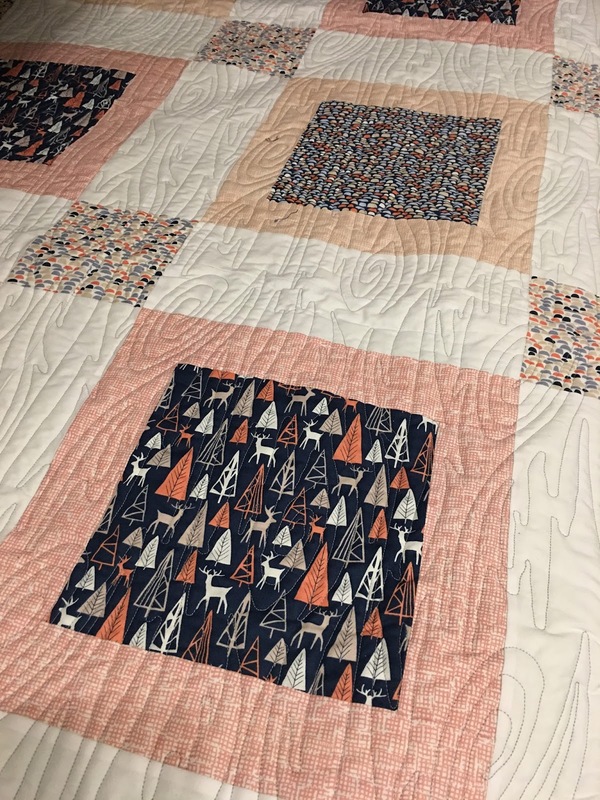 The full quilt keeps the focus on the fabric and both quilts are quilted by a long arm quilter with the pattern called Woodgrain. 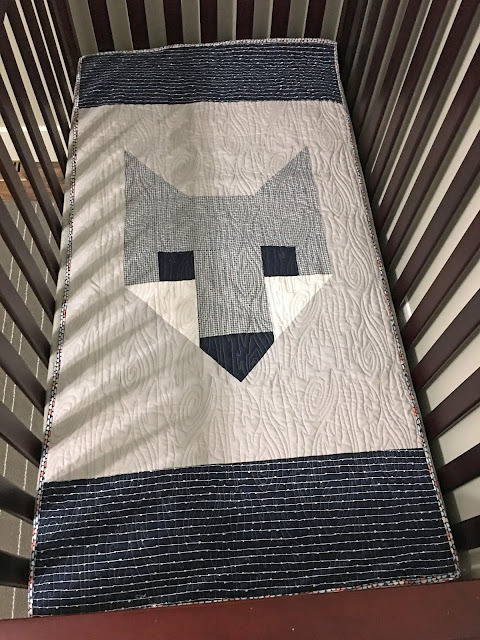 This pattern is Fancy Fox II by Elizabeth Hartman, I made the crib size adding a border to the top and bottom so it would fit the crib. 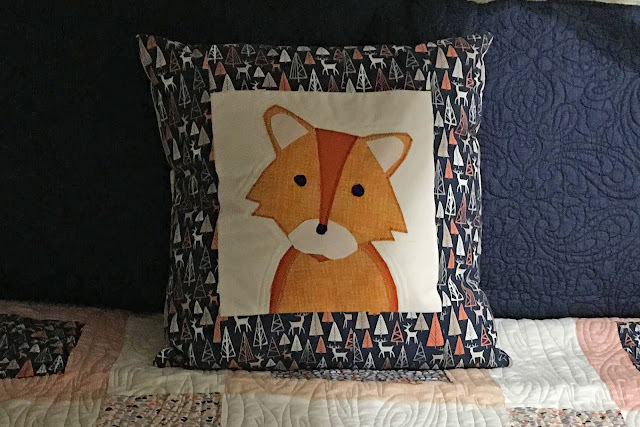 The rug came from Ikea, the shams from Target, deer sign from Hobby Lobby, the Fox Pillow from Sew Cute Critters Book and I want to make a couple of more. 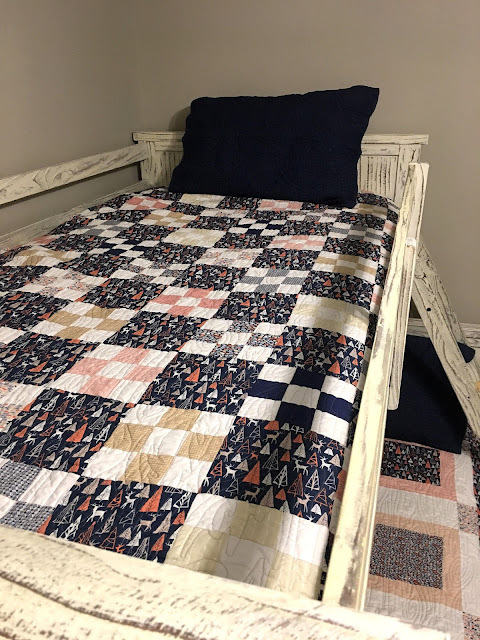 The full size quilt came back from the long arm a couple of weeks ago and I just finished the binding, it is so nice to have this room put together before 2017. 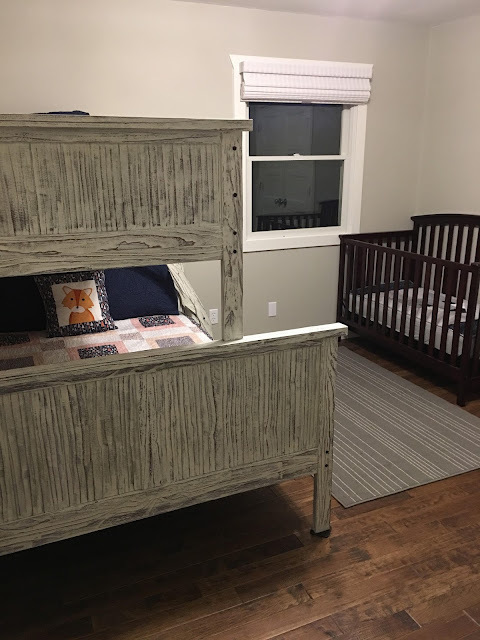 I think the look of this room will grow with boys and when their are granddaughters, I will pull out some of those floral quilts! So cute. I love those ideas for little boys. Thanks, it is a great room and I love how it turned out. What a cozy boys room! Thanks, Marianne, I started on another pillow yesterday, one of the grands helped pick out fabric. Such a great room Lori! 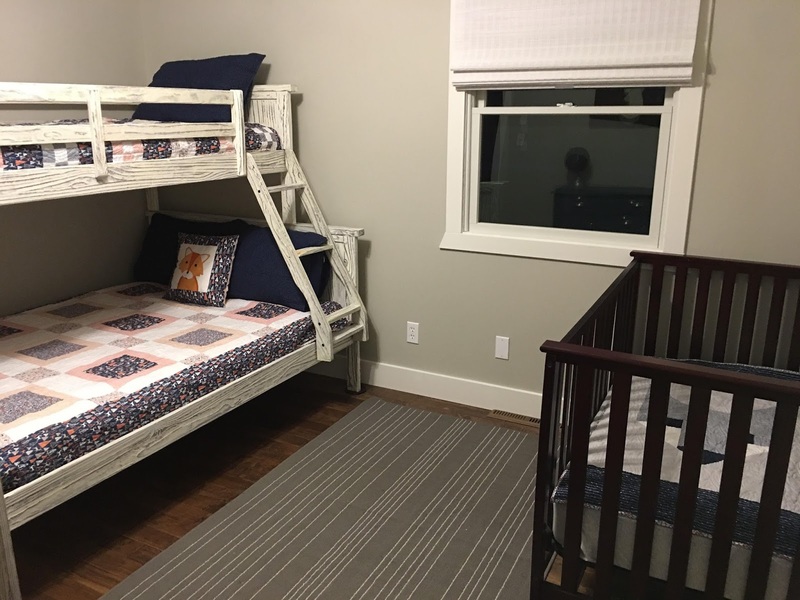 That would have been such a cute room, it is sad how fast they grow up. It seems like yesterday, my own girls were little. Great grands room! Happy New Year to you and your family! How wonderful to have grands! And all the memories that will happen in that room under your quilts. Thanks, Vicki, the oldest grandson loves to hang out in his room. What a great room! Those quilts are just perfect. Have a wonderful New Year!